There are quite a few new items this week, including the first melons and apples, more tomatoes, and lots more. I’m especially pleased to announced that Athens’ own Righteous Juice is offering a number of fresh juices starting this week. Their juices have gotten hard to find retail in Athens, so here’s your opportunity to load up the fridge each week. There are a several events coming up you should be aware of. First, local food advocacy group P.L.A.C.E. has organized “Taste Your Place”, a ten day series of events throughout town highlighting our local foods on July 17th through 26th. There are more events than I can list here, but you can find all the details at their website, linked above. We are also holding our third “Farmer for a Day” event on the 26th, hosted by Roots Farm. Previously known as Beaver Farm when run by Paul Chew, this farm has been bringing organic food to Athens for ten years or more. The Farmer for a Day event is free and includes lunch and a full tour, but reservations are needed. You can make reservations by adding them to your order—look in the “Event Reservations” category for details. Also, I’m teaching another cooking class at the Rolling Pin on Tuesday August 5th. I’ll be demonstrating how to make the most of the late summer veggies, including tomatoes, peppers, eggplant, okra, and more. The class costs $35, and you can sign up by calling the Rolling Pin at 706-354-8080. Finally, the new location is really working out well, from our standpoint anyway. The extra space gives us the opportunity to try some new things, so if there’s something you’d like to see on Thursdays (live music, “Meet the Farmer” events, tastings, etc.) send your ideas my way. Keep in mind that we have no utilities, so no water or electricity is available at the site. Thanks for all of your continues and growing support! We’ll see you on Thursday at the old farmers market building on Broad Street from 4:30 to 8pm. I hope everyone had a safe and happy Independence Day. My family went up to Dahlonega (not that much further than Athens is from our house) where the whole town and then some turned out for an old fashioned Fourth that included public readings of the Declaration and the Constitution, stump speeches on the town square, spontaneous bluegrass jam sessions on the sidewalk, a concert in the park, and a great fireworks display to top it all off. It was just like “the good old days”. You know, the days of old when food was grown largely by people you knew and you weren’t beholden to international conglomerates, free trade agreements, and the price of oil for the food you put on your plate. We’ve taken a few more steps toward our goal this week with the addition of a new farm, Dillwood Farms. You may have seen them the past two weeks at the Saturday market, and now their items are available through Athens Locally Grown as well. We’d grown to the point where most everything was selling out by Tuesday, so maybe this will help things spread out a little more. I’m also very, very happy to announce the first batch of pastured chicken from Nature’s Harmony Farm. It’s a small batch, but is hopefully just the first of many to come. Chicken is one of our most requested items, and I’m hopeful that Nature’s Harmony will show some of us other growers by example how to navigate the legal system and add poultry to our diversified farms. And on the topic of the legal system, we are experiencing a shortage of eggs right now. A new GA Ag. Dept. inspector has taken over the Athens beat, and is (in my opinion) over enforcing the rules. I’ll spare you the details (it involves the distinction between “mechanical refrigeration” vs. “refrigeration”), but several growers are sitting out on selling eggs until everything gets straightened out. Hopefully we can get that straightened out soon. Finally, I wanted to touch upon the issue of packaging. Now that everything is laid out right before you on Thursday, you’ve got a better idea of what is involved in organizing all of your orders. The growers pack and label each individual item (we’re not legally able to do that for them at market) for you, and that means a lot of bags. We all despise plastic as much as anyone, so we’re all doing what we can to make it more palatable. Some of us use bags you can easily reuse in your kitchen (such as “zip locks”). Some of us use paper. And some of us are experimenting with bags derived from cornstarch and other bio-degradable materials. And of course you can help out by bringing your own large reusable bags or boxes to take everything home in. If you don’t, we do have bags that are both recycled and recyclable (#2). In short, there’s more packaging that is ideal, but we’re certain that all considered we’re still much better than the grocery store. Thanks again for all of your support of your local growers. We’ll see you on Thursday from 4:30 to 8pm at the old state farmers market on Broad Street! I think everyone agreed that the new location (the old state farmers market building on Broad Street) worked out really well last week. The place has a lot of potential, and it was great to see what has become an essentially abandoned building get used again for what it was intended. It’s on the state’s surplus property list and could get sold at any time, but while its still available to us, we’ll be putting it to good use. If you’re looking for recipe ideas for how to put what’s in season right now to use in your kitchen, I’d love for you to join me Tuesday night at the Athens Rolling Pin (in the Beechwood shopping center). I’ll be teaching a cooking class on eating locally, using what’s in the peak of season right now. The class runs one night from 6:30 to 8:30 and costs $35. There are still seats available, and you can sign up by calling the Rolling Pin at 706-354-8080. Based on what was available at the Saturday market this week, I’ve put together a menu of Green Bean Salad with Pecans and Parmesan, Whipped Kohlrabi and Potatoes, Leek and Beet Soup, Calabacitas (a New Mexican dish featuring zucchini, onion, tomato, and corn), and Finnish Berry Rice. I’ll also be discussing the generalities of preparing early summer produce. And yes, I’ll be making enough for everyone! That’s about it for this week. You’ll see a whole great list of new items listed this week—give a spin through the “New Items” carousel to see what I mean. Thank you so much for your continued support! We’ll see you on Thursday from 4:30 to 8pm at the old state farmers market building on Broad Street. Please remember that Athens Locally Grown is moving to our new pickup location this week, just around the corner to the old farmers market building on Broad Street. If you want to program your GPS, use the address 2152 W. Broad Street. If you want to program your eyeball, just remember that we’re right next to KFC, which is on the east side of the Broad Street / Alps & Hawthorne intersection. If force of habit takes you to Gosford, say hi to Ben behind the counter for me and then turn right onto Alps, right again on Broad, and then left into the old farmers market building. Broad Street (and that intersection particularly) can be a bit of a bear, but there are three entrances, including one from Old Epps Bridge Road, so no matter the direction you’re coming from it should be easy for you to get in. 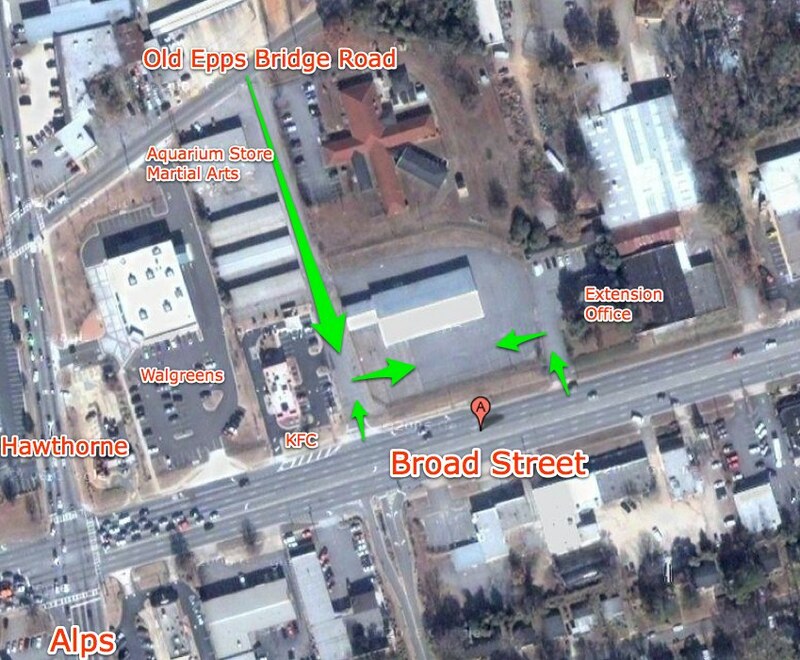 You bikers out there might want to use the Old Epps Bridge entrance, just so you can stay off Broad altogether. I’ve marked up an aerial photo of the neighborhood so you can see right where we are and how to get in. You can find it here. Also, here’s a link to Google Maps, so you can get driving directions if you need them. We’ll see you there, from 4:30 to 8pm tomorrow! Yes, this is the week that we’re moving over to the old state farmers market building on Broad Street. I’ll be sending out a separate email in the morning with directions, so you can save it, flag it, or bookmark it separate from this message. I’ve already changed the website, put up a map to the new place, and updated the automated emails. It’s literally only 1000 feet as the crow flies from where we’ve been, so you’ll not have any trouble getting there. There probably won’t be any major problems, but the different setup will likely be a little disruptive to our process, so please bear with us the first few weeks as we adapt. The biggest thing you’ll notice (besides the plentiful parking) is all of the produce will be right out in front of you instead of tucked away out back. We’ll still have a whole crew of volunteers getting it all together for you, so you won’t have to do that yourself, but you’ll now be able to see them do it. Apart from the location, everything else (such as our hours) will remain the same. Gloria and Winifred Lohr, owners of Diamond Hill Dairy, have retired and sold their dairy to another small dairy in their neighborhood. The new owners have changed the name to “Cows R Us” dairy and are committed to keeping the operation otherwise exactly the same. It’s still a small family operation, but the new owners now have two dairies—one raw and the other pasteurized. We’ll continue picking up every other week at the raw dairy, alternating with Milky Way dairy. New member grower Dewy Rose Boers and Beef has a hog ready for processing. They are not set up now to offer cuts, but if you have freezer space, you can buy a half or whole hog. You can find more info on their grower page. If you’re looking for live animals as farmyard pets, Fancy Feathers Farm has several available, including Aurucana roosters, pygmy goats, and emus. You can find more info on their grower page. The days are only going to get shorter from here, but the calendar says summer is now here. You’ll find tomatoes, beans, squash, peppers, and even a few eggplant listed this week. The berries, both blue and black, have also arrived, and there are even some plums listed. Everyone is suffering from lack of rain (the first two plantings of corn were largely a bust), but they’re all doing what they can to keep going. We all thank you for your growing support of everything we have growing. We’ll see you this Thursday from 4:30 to 8pm at our new location: the old state farmers market building located at 2152 W. Broad Street (right next to KFC). First off, thank you all for your patience with our late start last week, due to our delivery truck breaking down. It developed a leak in the cooling system, and that’s no good even when it’s not 100 degrees out. We were able to get it home, and it’s now sitting at our local Ford mechanic. We certainly hope they’re able to get her all patched up before Thursday. This is scheduled to be our last week at Gosford Wine. We’ll bid them a fond farewell this week, and then move on the 26th around the corner to the old farmer market structure on Broad Street. I’ll be sending out full directions and information in a few days in a separate email. The important thing is: we will be at Gosford this week. Also this week is our June “Farmer for a Day” event. We’re being hosted this Saturday by Dancing Sprout Farm, located within Athens. We’ll start at 10am on Saturday helping Geoff & Lisa Lewis with small projects around the farm, then break for lunch, and afterward Geoff & Lisa will take us on a full tour. The event is free, but we do ask that you make reservations due to the limited amount of space (and food at lunch). You can add reservations with your order – look in the “Event Reservations” category. You’ll also notice a small banner graphic at the top of every page on the website – you can click on that to see more information about our full summer lineup of “Farmer for a Day” events. And now, on to the produce. It’s still a little early for non-greenhouse tomatoes, but you’ll see some varieties beginning to make an appearance this week. The beans are also coming on strong, as well as the garlic, potatoes, some peppers, and lots of other goodies. Thank you for all your support, and we’ll see you one last time at Gosford Wine from 4:30 to 8pm! We’ve had five straight days of over 100 degree days at our house, and it’s a heck of a time for the air conditioner to be out of service. Normally on weekends I work in the gardens in short bursts, and come inside for some cool air and cold drink. This weekend, though, I pretty much stayed a puddle. I see the forecasters are saying the heat wave should break on Tuesday, at least enough to get us back in the 90s. It’s been far too hot to cook, of course, and we’ve been living primarily off cold canned fruit. Not local, unfortunately, but now I’m determined to try to put some up this summer for this time next year. We did manage to have one simple dinner yesterday, though, that was 100% local and managed to use items from ten or so Athens Locally Grown growers. Even better, I was able to cook it all outside, keeping the house a degree or so cooler. Here’s what I did: quarter up a variety of potatoes, slice some onion, and peel and mash three or four cloves of garlic. Pile all three up on a rectangle of double thickness aluminum foil, salt and pepper, add a pat of butter, and top with a few pinches of fresh herbs (rosemary plus whatever else you have). Fold the foil and crimp the edges to make a sealed pouch. Throw it right on hot coals. Turn after a couple minutes, and let cook a couple more until it swells up like a balloon. Push it over to a cool side of the grill. Slice some squash longwise, toss with just a splash of olive oil and salt and pepper, and put them over the hot coals. Turn after a couple minutes, and after a couple more, put them over on the cool side. We then put some Tink’s Beef over the hot coals, and cooked until just done (three or four minutes). Very, very simple, fast, and very very good. Perfect for a sweltering evening. You’ll find more summer items listed this week. The beans are coming in, there’s many varieties of potatoes coming up, lots of garlics (one of my favorite things about the Athens area growers is the sheer variety of garlic available), and other items are coming in. Finally, we have got the go ahead to move over to the old farmers market building on Broad Street starting June 26th. So, we’ll have two more weeks at Gosford. I’ll have more details, including directions for those of you not familiar (it’s right around the corner from Gosford), later on. Thank you again for all of your support! We’ll see you on Thursday from 4:30 to 8pm at Gosford Wine. Stay cool! Right on cue as we hit June, the listings this week see the tapering off of the Spring items and a growing number of summer veggies, including the season’s first beans and peppers, a wider variety of squash, and quite a few tomatoes. Right now there re 430 items total, and the “new products” carousel is full of items to browse through. A number of us had quite a rewarding and inspiring time at our first “farmer for a day” event way out at Nature’s Harmony Farm in Elberton. The energy and enthusiasm of the Youngs is infectious, and the quality of life of the farm animals was evident. Our next event will be June 21 at Dancing Sprout Farm in Athens, and you’re able to begin making reservations for that event now. We’re still planning on moving to the old Farmers Market building on Broad Street, but we’re waiting on word as to when exactly we can make the move. The earliest would be June 19, and it may even be later than that. I’ll be sure to tell you all when we set a date, but for the time being we’re keeping things at Gosford. Hopefully with school out, parking is a tiny bit better there. Thanks so much for all the support you give both Athens Locally Grown and all the member growers. I say it a lot, but it’s true that without you, none of this would be possible. We’ll see you Thursday from 4:30 to 8pm at Gosford Wine! I’m not sure which to trumpet the loudest: the often asked for but never to be found fava beans (50 lbs listed this week) or the year’s first slicing tomatoes (25lbs from Michael McMullan’s greenhouse). If neither of those grab you, maybe you’ll find some personal favorites listed among the 400 other products appearing this week. Now that the temps are hitting the 90s, some of these items will be on their way out, so it may be the last chance for a few things (like strawberries). I did get an overwhelming response regarding the possible move to the old farmers market building on Broad Street. Several hundred of you wrote with your enthusiastic thumbs up, including stories of shopping there as children, horror stories about parking in Alps, and so forth. Not a soul said they’d rather stay where we are, so I’ll be meeting with the powers that be this week about making the move as soon as possible. It wouldn’t be until mid to late June at the earliest, so we’ll have a few more weeks at Gosford yet. I’ll be sure to give you all the details as I learn them. Our first “Farmer For a Day” event is this coming Saturday. Nature’s Harmony Farm in Elberton will be hosting us, as we spend a couple hours doing light farm chores (it’s astounding how much help fifty unskilled hands can be for a grower, even for only two hours), have lunch on the farm, and then get a full tour. If you’d like to join us, just add the appropriate number of reservations to your order (you’ll find them in the “Event Reservations” category). The event is free. If you put a deposit on a Thanksgiving turkey from Nature’s Harmony, you’ll get to spot it running around the pasture. That’s about it for this week. We all thank you very much for your continued and growing support of your local growers! We’ll see you Thursday from 4:30 to 8pm at Gosford Wine!